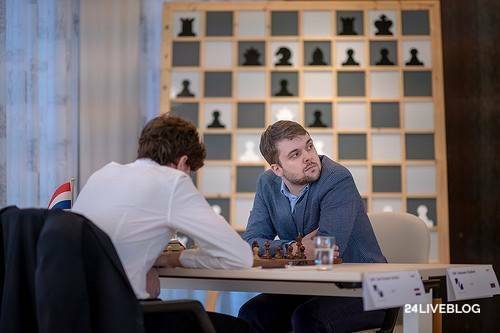 Today, in an all-decisive final round, Peter Svidler consolidated his match win over Sam Shankland with a fairly quiet draw: 3½-2½. After another long draw between Vladimir Fedoseev and Jorden van Foreest (3-3), the Russian and the Dutchman had to play a tiebreak, which was won 2-1 by Fedoseev after a tense fight. Bassem Amin won the Open by directly beating Dmitry Kryakvin in the final today, when the Russian GM allowed a decisive combination in a slightly worse position. 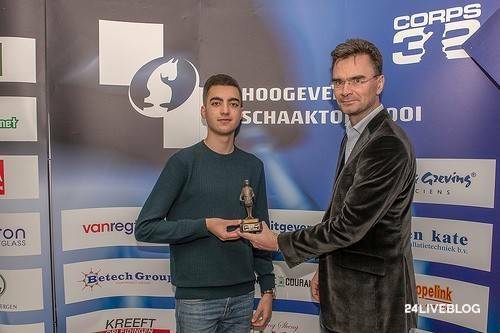 The battle for third place had to be decided in a playoff as Erik van den Doel and Eltaj Safarli drew their 'regular' game. 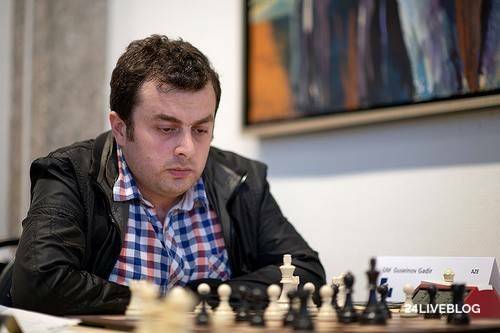 Azeri GM Safarli won the tiebreak by 1½-½, achieving third place. The 'Best of the Rest' in the Open were four players this time. 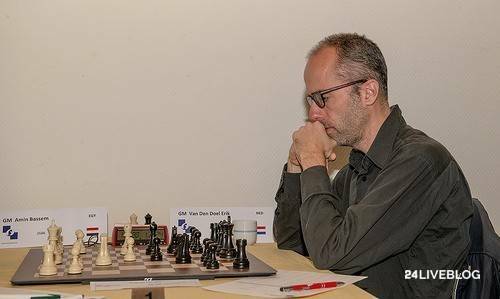 Roeland Pruijssers missed a win against Thomas Beerdsen and they drew, as did Valentin Buckels against P Karthikeyan. This allowed Gadir Guseinov to catch up on 6½ points. 13-year-old Rakshitta Ravi from India won a WIM-norm, and the rating prize was won by Dutchman Frans Konings. Tournament director Loek van Wely opened the final round of the Matches, the final and consolation final of the Open, and the 'rest' of the Open and said he hoped we would be closing off with an exciting last day. Eltaj Safarli (vs P Karthikeyan, round 6), P Iniyan (vs Roel Hamblok, round 6), and finally Kasper Bleeker (vs Yannic Husers, round 8). Peter Svidler opened with 1.c4 and after 1...g6 went for the same line he had already faced twice here in Hoogeveen, but deviated himself with 5.Qa4. Vladimir Fedoseev may have surprised Jorden van Foreest with 6...e5 after 6.Be2 in the Najdorf. Before he had opted for the Scheveningen set-up with ...e7-e6. With same-side castling the position is relatively quiet for an open Sicilian. 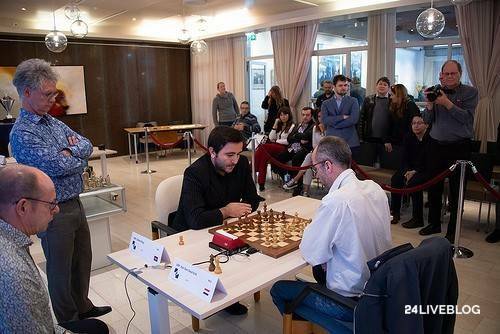 In the final of the open, Bassem Amin went for an ambitious set-up in a Closed Sicilian with f2-f4. In the 'consolation final', the struggle for third prize in the Open, Erik van den Doel is playing a Torre against Eltaj Safarli instead of the London Systems he tried yesterday against Dmitry Kryakvin in the semi-final and the second playoff game. Mila Zarkovic and Tijana Blagojevic adorned our playing field only for a very short time today. The computer had paired the two Serbian WIMs against each other, with an ultra-quick draw as a result. They did play 22 moves in an Exchange Ruy Lopez. In this slightly worse position Kryakvin blundered with 24...Bb7?? and now after the crushing reply 25.Qe8+! there is always a fork check on e6: 25...Rxe8 26.Rxe8+ Rf8(26...Kg7 27.Ne6+) 27.Rxf8+ Kxf8 28.Ne6+ Kf7 29.Nxc5 Bxg2+ 30.Kxg2 and the Russian GM had had enough. 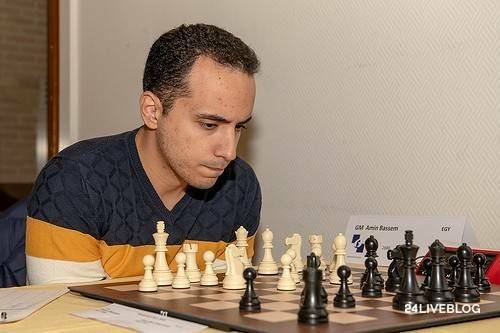 Congratulations to the super-GM from Egypt, who was always in the top of the rankings and was never really in trouble: a fully deserved tournament victory! The struggle for third place goed on. Eltaj Safarli offered a draw already early, Erik van den Doel first refused but then, on move 17, he decided to go for the blitz playoff anyway. Will he do better than yesterday against Kryakvin? With his careful strategy, Jorden van Foreest seemed to have a little something, but when he lost some time with the manoeuvre 21.Bg4 and 22.Bf3 Vladimir Fedoseev got full-fledged counterplay on the queenside, which seems to be enough compensation for the strong white knight on d5. Just ignoring the attack on the b3-pawn. If 14...Bxb3 15.Nd2 and now on 15...a4 (on 15...Bc2 there is 16.e5 with the same problem) 16.Nxb3 (16.Ra3? e5! is too slow) 16...axb3 17.e5! is strong, as Gert Ligterink explained in the commentary room. On 17...Nh5 18.Be3 Black has problems, and after 17...Ng4 18.h3 Nh6 White can push first g3-g4 and later d4-d5. 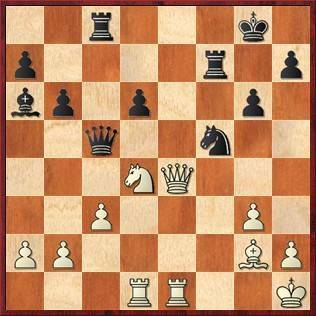 Shankland didn't take the b-pawn - he did this only on move 22, after White had cashed the a-pawn first. 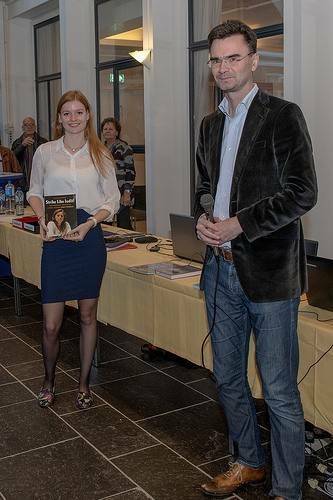 The rating prize went to Coert Joost (4½ point). 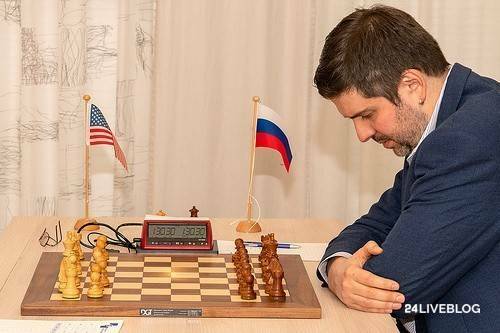 Gadir Guseinov achieved 6½ points today with a victory over Robert Baskin. The young German was attacking, but probably over-reached with his imposing pawn centre and lost not long after. Will the Azeri GM catch up with the 3 leaders? Vladimir Fedoseev is slowly increasing the pressure on the white position, and the people in the press room are expecting a long squeeze. The game Svidler-Shankland looks very equal, but the American is going to have to try something to save the match! Peter Svidler is consolidating - he has won Black's c5-pawn and is now a pawn up in a rook ending - so unless an earthquake happens he should be winning the match 3½-2½. The position in Van Foreest-Fedoseev seems dead equal again. 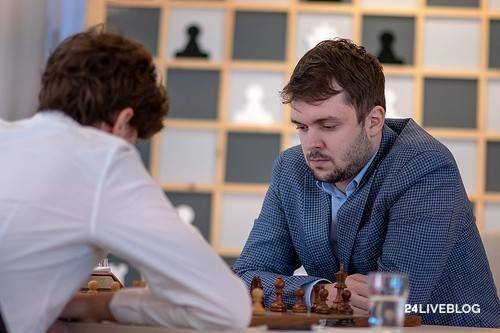 As every day, first Svidler and Shankland were finished, and after that, Van Foreest and Fedoseev. Today both games again ended in draws. 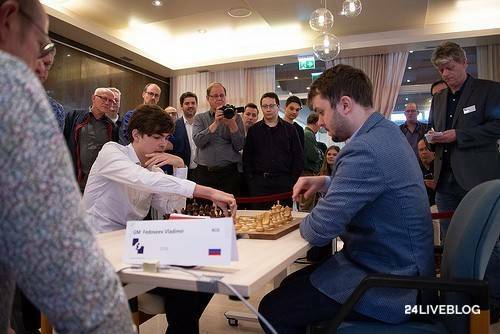 In the Svidler-Shankland game there were many interesting sidelines with all those minor pieces flying around. The gist was, as Svidler said: 'I can try to force a draw but I am better and I don't wanna beg for it.' 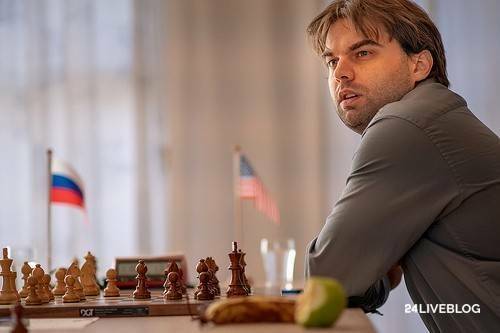 So with a pawn up in the rook endgame he didn't have to, and so he won the match 3½-2½. Fedoseev didn't manage to get anything concrete either, despite trying for a long time. This means that Jorden van Foreest has really increased his defensive abilities and shown that he can hold up against a world top player. The match will be decided by blitz games. Shankland was wondering when he was relaxing after the game: 'How many draws will they make in the blitz before someone finally wins...?' We'll soon see! 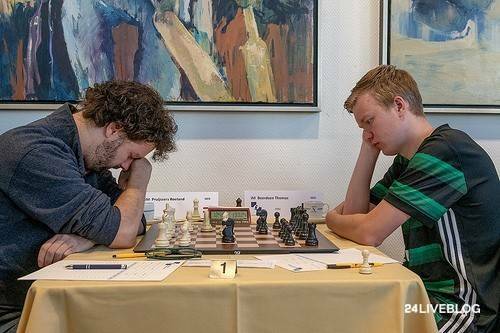 Two thrilling tiebreaks just decided third place in the open and match victory between Vladimir Fedoseev and Jorden van Foreest. First Erik van den Doel en Eltaj Safarli battled it out. Like yesterday, Van den Doel played very well but still didn't make it somehow. In the first game he was winning when he knocked down some of Safarli's pieces with his move 49...Ne2. Whether he was adjusting him in his own time or not, the Azeri, who had only 3 seconds left, immediately sat back, exclaiming 'This is not possible!' Chief arbiter Frans Peeters gave Safarli 10 seconds extra, and Van den Doel seemed to go on to win but blundered a rook just before move 50. In the second game, Van den Doel was pressing with white, but when time ran low he sacked a piece. Safarli could perhaps even have won but decided the match with a perpetual. In the first game in the other tiebreak, Fedoseev started with 1.b3 and showed some real powerplay. However Van Foreest defended very coolly. Vladimir started looking for a new plan and 'suddenly' lost on time. In the second game, the Russian played a Hippopotamus with black. Now Van Foreest was pressing, winning a pawn and playing fast, natural moves. However when he won 2 more pawns with a fork trick the result was that his knight got caught on d8. It was still highly unclear with 4 pawns for a piece, but Fedoseev converted excellently with 10 seconds to go after just about every move. Game 3 again started with 1.b3. After a while Fedoseev won an exchange for a pawn, but this was the sign for Van Foreest to start an attack on the white king. Just when the Russian had his defence organized, Van Foreest blundered with ...h4? and lost soon after. Fedoseev was getting ready for a fourth game, but then he heard that he had already won the match! After the 1-1 tie it was sudden death. So he won the match 5-4. This meant that Guseinov, Beerdsen, Buckels and Pruijssers ended in a tie on 6½ point. 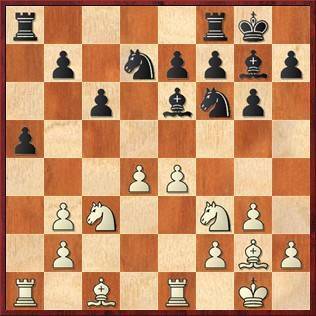 Rakshitta Ravi lost today from a probably winning position, missing a WGM norm. The 13-year-old from Chennai still has a WIM-norm, but that was small consolation. 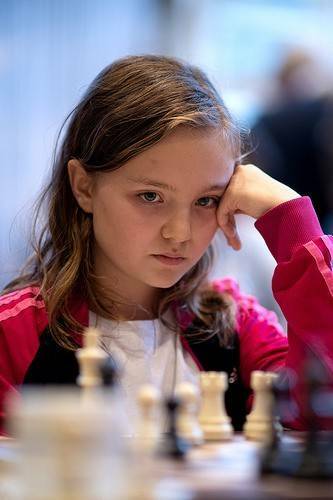 With a draw, Machteld van Foreest (11) drew even with her, as well as Elena Tomilova and Sonja Maria Bluhm as the highest-ending woman players, all on plus-1! 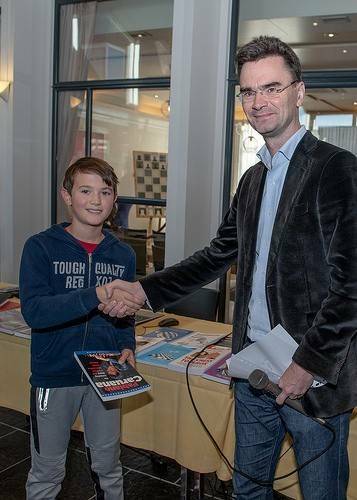 The rating prize goes to FM Frans Konings, who ended a wonderful tournament on a 6/9 score.